I’ve been testing a media loan Panasonic TZ7 (25-300mm 12x ultrazoom) compact digital camera for the last 2 months. The TZ in TZ7 stands for “Travellers Zoom” because this camera is aimed directly at the huge market of travelers who want a relatively small easy to use camera for their holidays but don’t want to compromise on image quality or only have 3-5x zoom. 300mm Zoom lens setting – Lets you zoom right up close and fill the full picture frame with photo subjects like wildlife or a specific person in a crowd. LCD Screen – 3 Inch 460,000 dot screen makes it easy to frame photos and view them afterwards and the Intelligent LCD function detects light conditions and automatically boosts backlighting by upto 40% making it easier to see. MODE dial – at top right of the camera which switches between Intelligent Auto, Program and Scene modes is far to easy to accidentally jog and change Modes while you’re using the Zoom lever next to it. This MODE button should require more finger push pressure to change. Few manual settings – If you want a compact camera which you can use in full manual settings mode look elsewhere, this camera was designed to be used by untrained photographers not enthusiasts. Should You Buy the Panasonic TZ7? Verdict: If you’re a backpacker or “mum and dad” camera buyer who wants a mostly automatic, easy to use small camera for your holidays with good image quality and the ability to take photos at wide angle and ultrazoom you should definitely buy the Panasonic TZ7. Everything we said about the Panasonic TZ5 holds true for its sister model TZ7. The camera’s metal body handles nicely and it delivers very good image quality at low ISOs and does a better job than most others in this test at higher sensitivities. However, the TZ7 improves on the TZ5 by adding an excellent 3.0 inch/460.000 dots LCD screen and a very versatile HD movie mode to the package. It’s no secret that I really liked last year’s Panasonic Lumix DMC-TZ5. 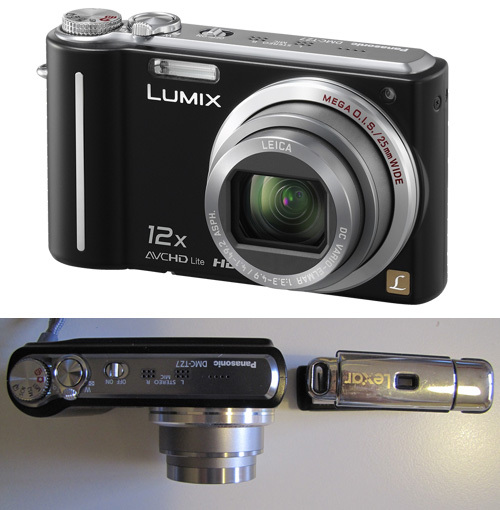 Its replacement – the Lumix DMC-ZS3 (also known as the TZ7) – is even better, in most respects. I love the new lens and its very versatile focal range, and the Intelligent Auto Mode and face detection functions have been nicely enhanced. And that’s on top of the amazing 3-inch LCD, easy-to-use interface, and snappy performance that the ZS3 inherited from the TZ5. While I like the ZS3’s ability to record longer movies than its predecessor, the new ADCHD Lite codec is a pain to work with. The ZS3 is also in desperate need of some manual controls – I was really hoping they’d appear on this model, but no luck. Despite these and a few other shortcomings, the DMC-ZS3 remains an excellent travel camera, and one that I can highly recommend. Thanks for the great review. I am currently searching for a camera to buy. I am also a fan of panasonic brand. I have my LCD HDTV that is from panasonic. So I will be expecting that this product is also good.